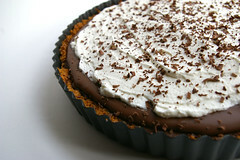 My good friend Jeff makes a delicious french silk pie around the holidays. Because it's an easy recipe, I wanted to share it here for others to try this holiday season. In a bowl beat sugar and butter with an electric mixer on medium speed until fluffy (beat for at least 5 minutes). Stir in chocolate and vanilla. Add eggs, one at a time, beating on high speed after each addition, scraping sides of bowl frequently. Cover and chill for 5 to 24 hours or until set. Made one of these pies this weekend and I have to say - easy and delicious. Give it a try sometime!